It started out strong. Coming out of the House of M, Carol Danvers wanted to be the hero she was in that parallel universe. In that world, she was the Captain Marvel, the greatest hero on Earth. She saw that she had the potential to be the greatest hero of the Marvel Universe and aspired to make that a reality. While the book flirted with that actually happening, nearly every plot thread was either dropped or never paid off with any satisfaction. A new enemy was introduced for her that came from the House of M world: Warren Traveller, the Sorcerer Supreme (i.e. that world’s Doctor Strange). It was a great idea, here’s someone that had fought her countless times and knew every detail about her, but Carol (and the readers) had never seen him before (this flies in the face of other House of M logic since she should remember everything about that life, but whatever). However, he was quickly written off and the only thing that remained was a cat that got caught up in one of their battles, now Carol’s pet. Soon after came an interesting arc where Carol confronted Rogue featuring excellent artwork from the late Mike Wieringo. These two characters have amazing history together. Rogue got her super strength, invulnerability and flight from permanently absorbing Ms. Marvel in her last series leaving her in a coma, and this confrontation should have made for a great story. It somehow was contaminated by a second Carol Danvers from an alternate dimension that was boxed up by SHIELD and never heard from again. Again things got interesting after Civil War when Ms. Marvel was given her own SHIELD special operations team called Operation: Lightning Storm, consisting of Sleepwalker and Machine Man among others. The dynamic among the characters was great, the missions were interesting, and the character Chen was a real mystery. Araña and Arachne were also part of the supporting cast and added a lot of potential, but again, the plug was pulled just after Secret Invasion and the characters were scattered to the wind. 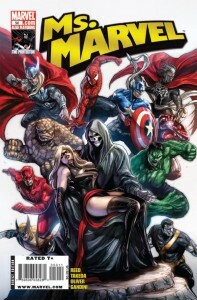 After Secret Invasion, it was pretty much all downhill. 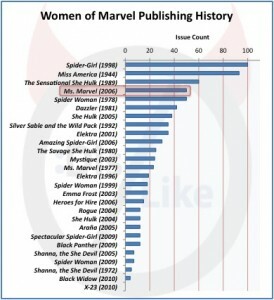 At one point during Dark Reign, Carol was “killed” and the book was taken over by Norman Osborn’s Dark Ms. Marvel, Karla Sofen a.k.a Moonstone. While she’s a great character in her own right, it was clear Carol wasn’t dead since this wasn’t even acknowledged in any other book. She eventually came back in an epically confusing story involving the Storyteller-MODOK-babies introduced in a Ms. Marvel one-shot somewhere along the line. Most installments of the 50-issue volume were drawn by either Roberto De La Torre, Aaron Lopresti or Sana Takeda. All three did fine work on the series and in all honesty the book never really suffered artistically. Some truly beautiful cover work was also done for the title by the likes of Frank Cho, Greg Horn and Phil Jimenez. 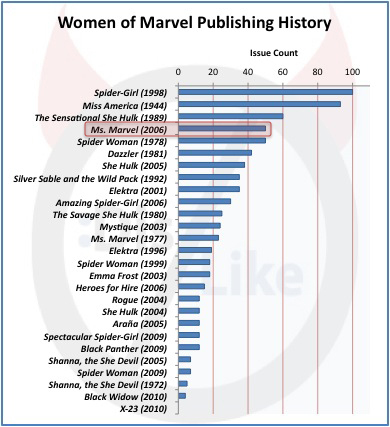 Most covers for the series present Ms. Marvel as the strong lead character the publisher wants her to be (though some of Horn’s images might not have aimed for that particular mark), but the stories within didn’t achieve that goal. All in all, the book’s writer Brian Reed had some great concepts but they suffered from terrible execution. I wanted to like the character and the book, but I really couldn’t despite my best efforts. 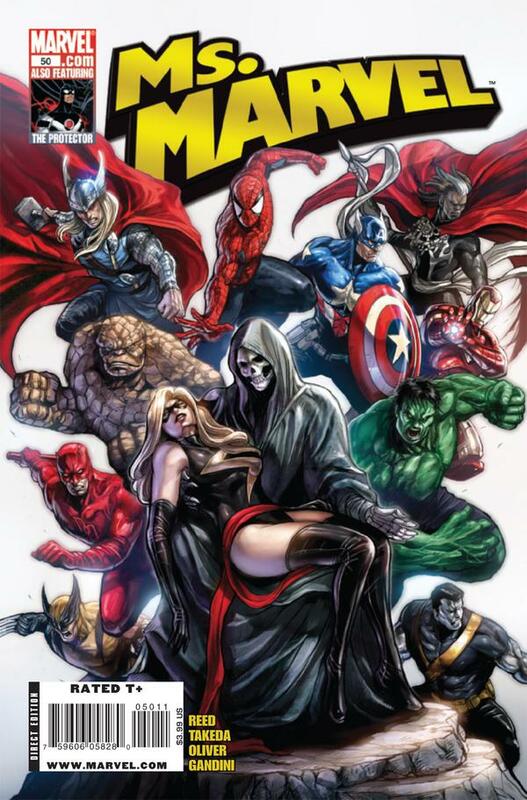 A case can be made that the title fell victim to too many crossovers, and it’s fair since it was born out of House of M, and tied into Civil War, The Initiative, Secret Invasion, and Dark Reign over the course of 50 issues. While I’d have loved to have seen some of these stories followed up properly, I’m kind of relieved that it’s gone for now. 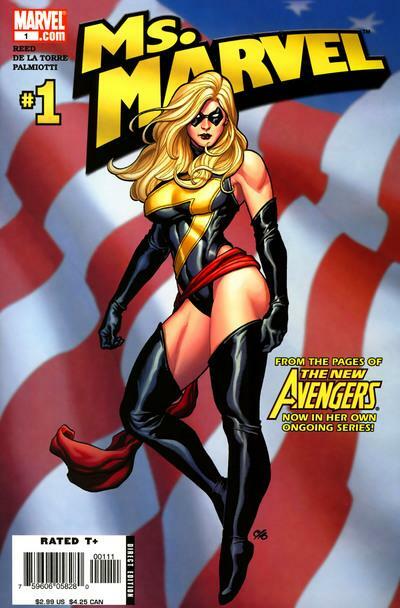 Ms. Marvel continues to appear in the pages of the various Heroic Age Avengers titles, particularly Brian Bendis’ New Avengers. 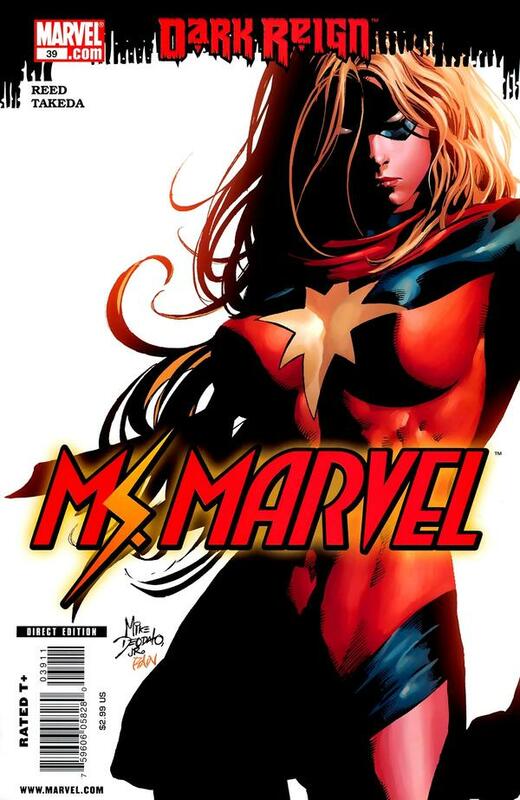 The entire Ms. Marvel series is available in collection editions like the Best You Can Be (Vol. 9) trade paperback released last week. I’d avoid that one, but highlights of this series include the Brood storyline in issues 1-3 (Vol. 1), the Puppet Master saga in issues 18-20 (Vol. 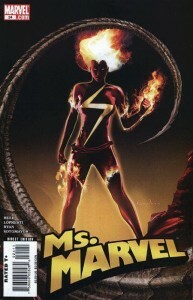 4), Carol’s backstory as a secret agent in issues 32-34, and the Storyteller one-shot (both in Vol. 6).